Complex reactions between a bird’s beak, eyes, brain, and ears allow it to accurately navigate across thousands of kilometers. This endangered golden-cheeked warbler navigates between central Texas and southern Mexico every year. Many species of birds migrate thousands of kilometers every year. Migration is driven mostly by weather and the availability of food. In the springtime, birds migrate to temperate regions, where food is plentiful and birds may safely create nests. In autumn, birds migrate to warmer latitudes, following their food sources and more comfortable weather patterns. In the Northern Hemisphere, birds generally fly south for the winter. In the Southern Hemisphere, they generally fly north for the winter. The flight paths used by birds in their annual migrations are called flyways. Scientists are not entirely sure how birds navigate their flyways. They seem to have an internal global positioning system (GPS) that allows them to follow the same pattern every year. A young bird imprints on the sun and stars to help orient it. Some researchers think a bird may also recognize landmarks. Individual organs also contribute to a bird’s remarkable navigational ability. 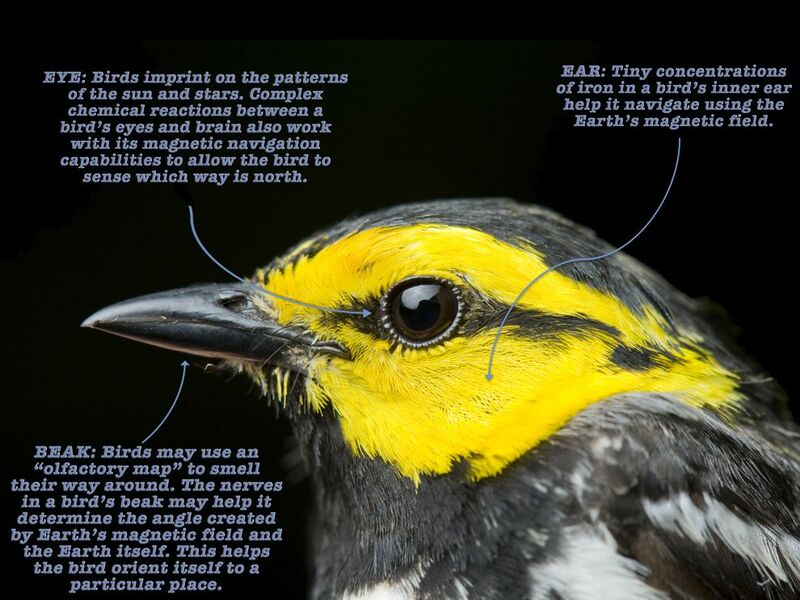 A bird’s eyes interact with its brain in a region called “cluster N”, which probably helps the bird determine which way is north. Tiny amounts of iron in the neurons of a bird’s inner ear also help in this determination. Most surprisingly, a bird’s beak helps contribute to its navigational ability. The beak helps birds determine their exact position. Some researchers think a bird can smell its way across a flyway. This “olfactory map” would orient a bird to terrain and topography. The trigeminal nerve, which connects a bird’s beak to its brain, may also help a bird assess its exact location. Researchers think the trigeminal nerve may help birds evaluate the strength of the Earth’s magnetic field, which is stronger at the poles and weaker at the Equator. Think about the way a bird’s physiology contributes to its ability to navigate, and see if you can guess the outcome of the experiments in the “Questions” tab. In one experiment, a researcher placed mirrors around his birds’ cages. The position of the mirrors gave a false orientation (east-west direction) of the sun. How do you think the birds reacted when released? The birds navigated using the false direction of the sun, not the real one. In another experiment, researchers placed a magnetic device around their birds’ cages. This device (called a Helmholtz coil) created a magnetic field oriented in the opposite direction of Earth’s actual magnetic field. How do you think the birds reacted when released? The birds navigated in the opposite direction, influenced by the flipped "magnetic compass." A more invasive project involved a researcher cutting his birds’ trigeminal nerves. (Birds are able to safely survive this procedure!) How do you think these birds navigated? Look at this high-resolution map of “Bird Migration in the Americas.” What species of birds have flyways near you? The Economist: The Economist Explains—How Do Birds Navigate? migration route regularly used by birds, bats, or butterflies. to acquire a habit or behavior through a learning process that occurs early in the life of a social animal, usually through an association with a parent or role model. part of the nervous system that registers sensation and touch. impulse-conducting cell found in the nervous system. Also called a nerve cell and neurocyte. having to do with smell or the sense of smell. group of tissues that perform a specialized task. to position or find the location of something.